New Ford Focus RS revealed | What Car? These are the first official pictures of the new Ford Focus RS. It is pictured undergoing testing at the Nurburgring racing circuit, ahead of its official launch at the British Motor Show on July 22. Ford has confirmed that it will be front-wheel drive, powered by a turbocharged 278bhp 2.5-litre engine with 295lb ft of pulling power. 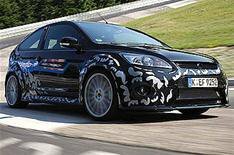 Ford is promising that the Focus RS will amplify the performance qualities of the ST hot hatch, using know-how from the company's World Rally Championship programme.